I am a fan of shawarma. I remember back in my grade school days that I would beg my mom to buy me one from my school's canteen. That was when Funwich was the choice dessert and shawarma the main course of every kid's menu. I barely remember how much that cost, all I know is that I love the crunchiness of the white onions, the savory spicy sauce and the tender beef colliding in my mouth as angels sang in the heavens. Yes, I was a bit dramatic even way back! 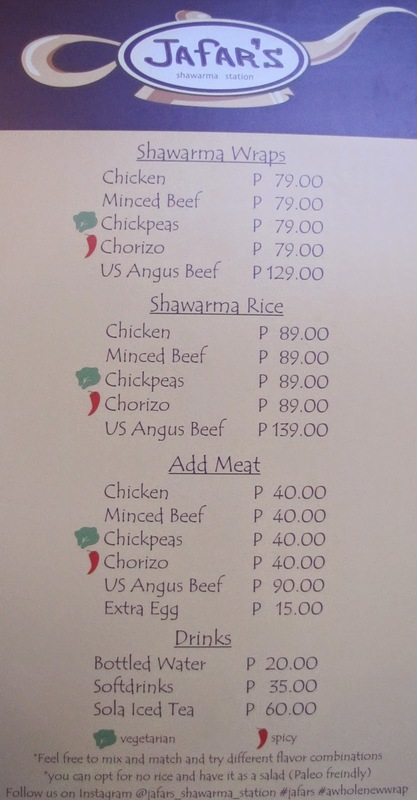 Fast forward to today, I have had my share of shawarma from a few places here in Cebu. And since taste is merely a subjective issue, I could say that I only have 1 favorite shop until a game changer changed everything. How could you be so sinful? Succulent Angus Beef, sweet and tangy yogurt sauce mixed with the freshest ingredients of slices cabbage, onions, cucumber and tomatoes. Wrap or rice? Either way is totally indulgent that you can't help but feel a bit guilty after devouring it! Serving behemoth shawarma rice and chunky wraps, this my friends is a sin worth committing for. You get to select your meat for the carnivore and of course a lean version for the vegans as they have chickpeas available. The Angus beef is my all time favorite! Yes, it is a tad bit expensive than that of the usual places but it certainly is worth every cent. The Shawarma Rice serving is enough to serve 2 people. Don't fret if you have a low chili tolerance, you can inform the staff about the sauce. They have mild, average and spicy. I opted for the spicy once and regretted it forever. I prefer the average to kickoff your taste buds without overpowering the entire meal. Mind you, I am not the only one loving this place. Expect a wait time and even standing queues as patrons head out to eat early dinner until closing time. I prefer the Banilad Town Center branch as it is closest to me and buy myself a cold drink while waiting for my order to be ready. They also have a branch in Rustans in the new wing of Ayala Center Cebu. Expect to get your order in 10-15 minutes tops. Shoppers and curious onlookers crowd the area almost anytime of the day. Patience is a virtue and trust me all that queue and waiting is worth it! What is real shawarma Chef?